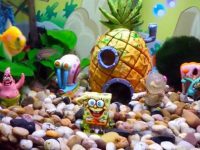 Action aquarium ornaments are things which can create some wonderful actions in fish tanks. 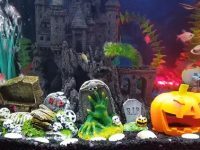 These decorations are usually powered by an external aquarium air pump (buy separately); some comes with colorful LEDs which offer various lighting effects and make everything look lively and interesting. 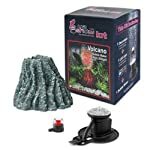 Hydor H2Show ornament kits include various wonderful ornament kits for aquarium such as volcano, crystal, Greek temple, Coliseum, Pyramid, stump. 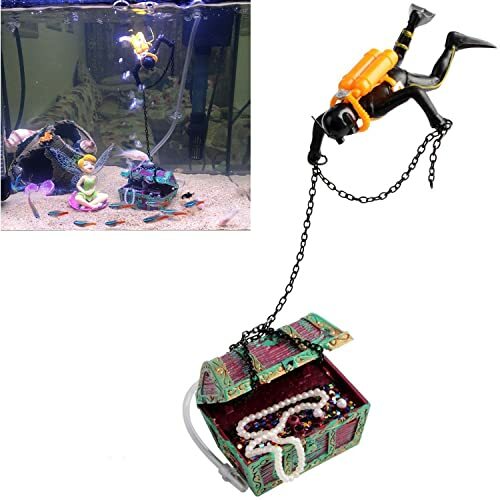 They come complete with an air pump and underwater LED light that perfectly fit inside the main ornaments and can work in underwater environment. This hand-painted volcano bubbler comes with its own aerator and LED light that fits nicely underneath the volcano that makes them hidden from view. 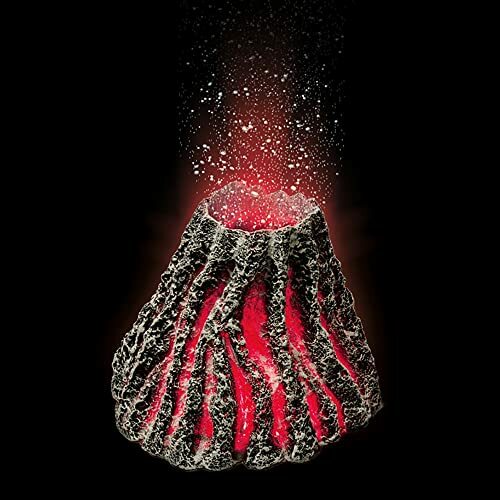 The red LED lights with the bubbles from the bubbler create wonderful effects which are the bright red flames and lava shooting out of the top of the erupting volcano. This unit consumes very little energy, so little in fact that most users choose to leave it on permanently. 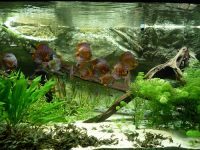 It is an ideal action decoration for a 20-50 gallon freshwater aquarium. It comes with everything you need for the setup such as aerator, LED light, tubing and suction cups. Here is another one of the high-quality self-aerating aquarium action ornaments from Hydor. This time it’s a transparent crystal that is hand painted to have a rock finish. The crystal structure is mounted on a base which conceals all the equipment included for the operation of the entire ornament such as bubble maker and LED light. It comes with multi-color LEDs instead of only one color, the light is able to change from red to blue and to green. When the light shines through the transparent “crystal”, the tiny bubbles from the bubbler are also colored and become colorful. They all provide an eye-catching dazzling effect to attract anyone who looks at it for the first time. 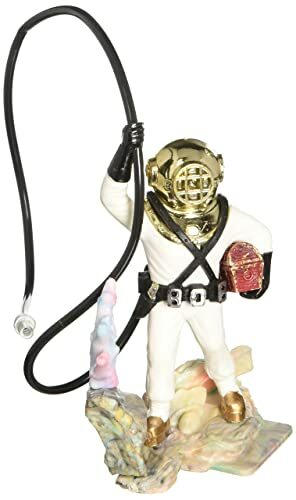 This diver ornament is positioned on the bottom of the aquarium. The diver comes with a hose which is used to connect and get air from an external air pump (buy separately). Then, the bubbles from the air pump will come out from the two sides of the helmet that mimics the breathing of a diver undersea. In order for an equal amount of bubbles to come out both sides of the helmet, this ornament needs to be leveled. If it isn’t anchored, the diver will float freely in the tank. By burying it in gravel, the ornament is fixed to the aquarium bottom. 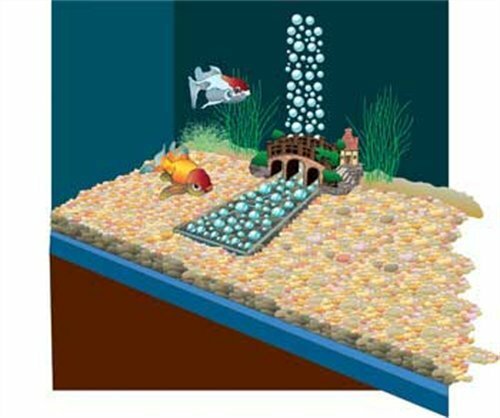 In the case that there is no gravel in your fish tank (sand for example), you can use suction cups to position it. Using hot glue to attach the suction cups to the bottom of the diver. This non-toxic ornament needs to be attached to an air pump (not included) in order to have the treasure chest open and close as bubbles flow through it. You can use an air valve to increase or decrease the flow of air bubbles to the treasure chest. Where by, the rate at which the lid opens and closes is controlled. 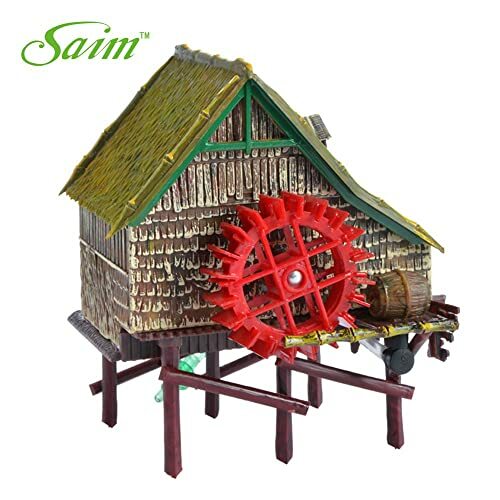 It is suitable for both freshwater and saltwater tanks. You will need to buy an air pump and 3/16″ tubing (not included) to complete the setup. 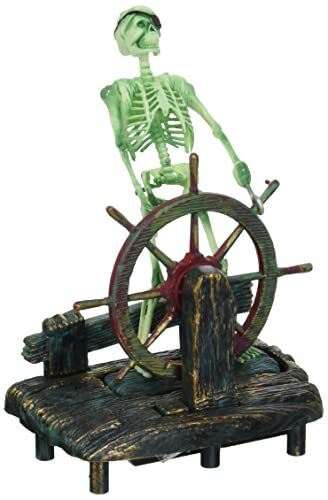 This skeleton ship captain humorously moves his helm left and right as bubbles rise up under his legs. An air pump and tubing is required and is sold separately. A gang valve is also highly recommended. 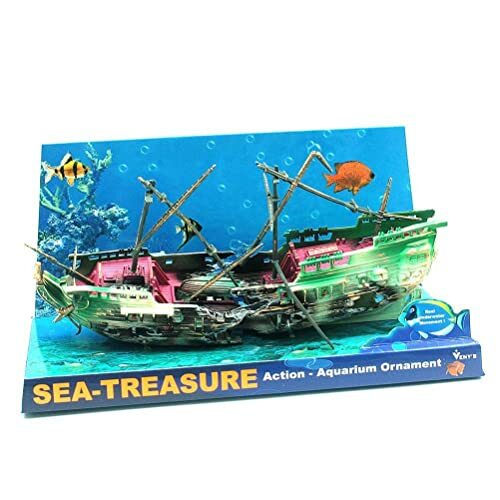 Everything needed to create an underwater river effect is included in this ornament kit such as air pump, decorative ornament, tubing, river housing, suction cups, check valve and fittings. When the ornament is running, the air bubbles created by the air pump is pushed from one end to the bridge end; the bubbles flow in one direction that stimulates the effect of an underwater river. It should be noted; however, that this is larger than many of the other aquarium action ornaments on the market, so depending on the size of a fish tank there may not be much room left over for other ornaments. At least a ten-gallon tank is needed for this ornament. Although it can be installed when the tank is full it is considerably easier to affix the suction cups to the bottom of the tank before it is filled with water. When it is attached to an external air pump with 3/16″ tubing, the wheel of this windmill ornament spins as bubbles rise up which oxygenate the tank. A pressure valve is highly recommended as this can regulate the amount of air which flows through the ornament, thus allowing to control the speed of the wheel spinning. When the sunken ship is powered by an air pump, it moves as if it is pushed by the ocean currents. 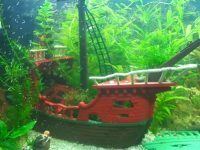 If you want to set up a shipwreck fish tank theme, this action sunken ship is an lively addition to the silent screen of the theme. Tip! If you want to run many action ornaments with only an air pump, you can buy a multi-outlet air pump or use some accessories for branching the tubing. All you need is in this guide: https://lovefishtank.com/aquarium-air-pump/.